It's time for a fresh new look! Caught a major case of spring fever? Us too! With sunny days and warm temperatures on the horizon, we're ready to switch things up and are craving a fresh, new hair color. Luckily, there are plenty of hues on trend for spring 2019, and they're all pretty darn gorgeous. To help you decide what spring hair color to choose, TODAY Style tapped two colorists to break down the top five looks of the season. Now the only hard part will be deciding on just one color! Feeling a bit indulgent? This rich, shiny trend is all about treating your brunette locks to flavor — aka flirty highlights. "Think of this hair color like a very decadent cake. It has some golden undertones to complement most skin tones, and works especially well with both warm and olive skin tones," said Stephanie Brown, New York colorist at IGK Soho. Wondering what to request at the salon? Ask for a warm, reflective brown. "You want something for easy maintenance such as a dark brunette with lighter brown tips for movement and dimension. Accepting the warmth eases the color-fading process between appointments and a lack of dimension towards the root allows for an easy growing-out process," said colorist Bianca Hillier of Andy Lecompte Salon in Los Angeles. Copper hair is on fire this spring! The bright shade is great for darker redheads with olive and cooler undertones. "This rich, silky warm color is a mixture of copper and neutral tones so you don’t get that orange feel when you step out in the sun," Brown said. The key to copper-colored hair? Matching it to your skin tone. "It's important to consider how pink or yellow your skin tone is so you don't overwhelm your overall appearance. For someone with a bit of pink in their face, it's better to use golden tones as opposed to red ones because too much warmth will cause their skin to appear even more red," Hillier said. Make sure to ask your colorist for a copper base but a mixture of neutral and very subtle highlights and lowlights. "In some cases, you won’t even need the highlights, and the lowlights will be enough!" Brown said. Stark platinum shades are on their way out and are ushering in warm, creamy blonds for spring. "It’s time to enhance the natural tones in the hair and step away from the gray blonds. When you don’t fight the natural underlying pigment and work with it instead, the fade is always more desirable," Hillier said. The shade du jour is a marriage of warm blond and the "snow bunny blond" look Brown says features plenty of highlights. So basically, it's pretty much a baby blond. "Ask your stylist for paler and fine highlights and to warm up your base color. Since this is a mixture of warm and cool, it works well with all skin tones," Brown said. 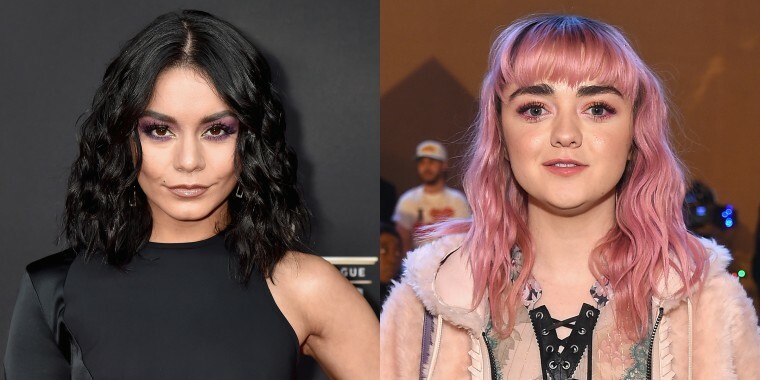 Pretty pinks have been trending for months, and celebrities have jumped on the girly hair color trend. And this spring, all sorts of pastels will be descending on a salon near you. "As we approach Coachella and festival season, the fantasy colors come out to play. This year I am interested in faint pink tones with a hint of peach for an easy growing out process. Be sure to ask your colorist for something that will completely fade out of the hair, allowing you to avoid another bleaching session," Hillier said. Pastels are on the rise, but this spring, they'll be a bit more powdery and faded. "Soft blues and pinks will be seen a lot. This look is for the person who has very pale highlights or platinum white hair. Make sure there are no yellow tones in your hair otherwise you’ll lose the powdery look of these pastel colors," Brown said. Since they're so pale, these pastels are somewhat harder to maintain, so make sure you invest in some good color protectants to make your color last. You might typically associate deep, dark tones with the dreary months of winter, but this spring, many ladies are turning to the dark side. "We're experiencing a lust for rich and more shiny tones. Dark hues can be universally flattering, especially when you opt for juicy, suede-like blacks that keep everyone looking fresh," Hillier said. If you're looking for the ultimate shiny, inky look, Brown suggests asking your colorist for a black hue with just a hint of blue. "This shade goes well with the glass hair trend because the black will give the shine you want. And it works best on darker and neutral skin tones — you don’t want to wash yourself out if you have a paler skin tone," Brown said.